How do I set up network access from Windows 10? From older Window versions? From a Mac? - Thanks to John McClintock for these MAC tips. On initial setup, I can't establish a Ethernet communications from a Windows PC. Help! What is the default IP address? How do I reset to defaults? How do I set up a router to port forward for Internet access? -Thanks to Mike G. Find more specific port forwarding examples here. What is the default IP address? How is the switch wired internally? What's the schematic? Do you have a .STEP file? How do I wire the switch? Does the switch support negative or positive ground? What wiring gauge should I use? What are the contact ratings? How are the A & B busses connected? Are the returns tied? What is the power dissipation? What are the mounting dimensions? What's the new Lua Language and Scripting all about? The session timeout is too short. Can I make the session longer? What are the CRITICAL and PROTECT functions? Can you develop customfirmware or custom hardware for my application? What's syslog? How can I keep an event log? How do I enable AutoPing? Can you explain theAutoPing settings? How can I connect to Amazon Echo, Alexa, Dot or Tap products? How can I connect to Google Assistant or Google Home? How can I access the switch from my own application or remote script? What's the cURL API? My program ran fine on an earlier design like the Web Power Switch 7, but doesn't connect now. Help! Is this product compatible with legacy plaintext scripts and http control? How can I control the switch from my own applications? What is the recommended REST API? Have any SNMP setup tips? How can I set up IFTTT? Do you have a C++ programming example? Do you have a .NET programming example? Do you have a Java programming example? Do you have a compiled Windows command line tool or a Perl example? Do you have a Python programming example? Do you have a Crestron control module? How can I run a perl script from LabView? Where can I find iPhone, iPad, or Android apps for Digital Loggers? Q: What's new in the product? The product has been completely re-designed around a 32 bit processor. We've added a Rest API, WiFi, HTTPS, SSL, SSH, and Lua Scripting. You can now order custom circuit breaker ratings on volume orders. Q: How is it wired internally? The product has been designed to operate on either negative or positive rails. The relays are grouped into two groups of four. Each group runs on an independent bus and is protected by a 50A breaker. For clarity, the controls including the wide-range DC-DC converter, control micro, and contact protection are not shown. Q: What's universal voltage? Does it support positive or negative ground? The product has been designed to operate on either negative or positive rails. In other words, the switch can either supply (source) or sink current. This simplifies wiring in systems with either positive or negative ground (ie. -48V telecom applications). Each bus may be supplied from a separate circuit, and the product is fully isolated from ground. The return terminals are tied together internally. If you'd prefer to power everything from a single input bus, just tie the input power terminals together externally. Universal voltage means the product is guaranteed to operate between 12 and 72 VDC. An internal under-voltage lockout occurs if the input voltage drops below 11.5V (full discharge in a 12V battery-operated system). Q: What are the contact ratings? All eight internal T-90 Relays are rated at 30/40A DC. Contacts are MOV protected. Relays are RU and CE approved, and rated at 250,000 operations MTBF at 50% load. Case terminals are rated at 25A. Input terminals and breakers are rated at 50. Output breakers are nominally rated at 15A. Other output breakers may be installed by special order. Only stranded wire of appropriate gauge should be used. Terminals must be well torqued. It is wise to recheck torque after completing the installation. Heavy traces and gold plating are used to minimize internal resistance between the terminals and relay contacts, typically 25m Ohms, so internal contact power dissipation is not normally a consideration. For maximum flexibility an internal MOV is provided for arc protection across each contact. Switching a large inrush current, or inductive load? Have a look at this article. Q: How are the A&B busses connected? The first four relays connect to "BUS A". 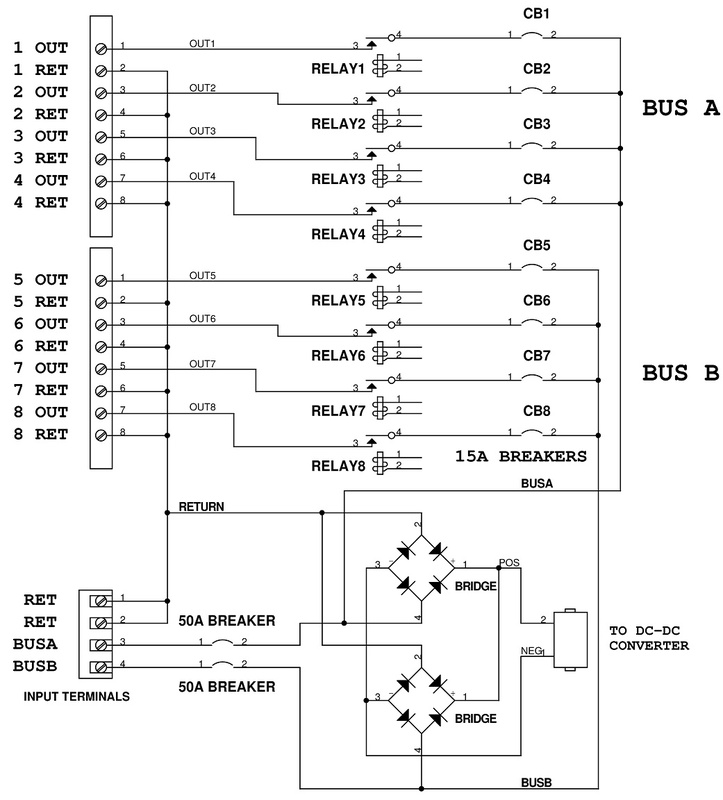 Relays 5-8 connect to "BUS B". The web server is powered from either bus. The return connections are bonded internally. Returns are isolated and ungrounded. Jumper them to ground externally if you prefer. Each bus and branch circuit includes a separate breaker. The controller dissipates a maximum of 9.48W at 11.5VDC input with all relays on. Power dissipation decreases with input voltage due to the use of an efficient switching power supply. Typical dissipation with relays off is 3.1W. Although the case is well ventilated, ambient air temperature should not exceed 140F for maximum reliability. The internal power supply is redundant and diode isolated. It is powered by either the A or B bus. Q: What are the mounting dimensions and physical size? RETMA 1-U form factor, 10" chassis depth not including connectors and keypad. Recommend 13" mounting depth including allowance for terminals and cable bend radius. Reserving a 13" depth will give you 1" front panel clearance and 2" at the back for cabling. The chassis itself is height 1.750", width 17.00", ear-to-ear width 19.00. Front panel keypad extends 0.15" from front panel. SMA WiFi antenna connector extends 0.55" from front panel, not including antenna. Here's STEP file for the chassis. Q: What is the default IP address? How do I reset to defaults? What is the default password? If you have lost the IP address or admin password or selected DHCP when it is not available, you can reset to the default IP address of 192.168.0.100. Press and hold the reset button to enter the reset menu. Choose the appropriate option and reset to defaults. The reset button is accessible through a hole near the Ethernet jack. Gently press it with a pencil or small tool. The default master login is "admin" and default password is "1234". Here's more information on using the keypad to change basic settings. See the manual for more information on the reset procedure. Q: On initial setup, I can't establish a Ethernet communications from a Windows PC. Help! If your default Windows settings won�t access the controller, follow these steps to reach the controller's IP, or change network settings using the keypad interface described here. Before adding an IP, close network programs and browsers. Go to the Network Settings – Local Area Network or use the keyboard shortcut <Windows-R> - type “ncpa.cpl” and click OK. Highlight “Internet Protocol” and click the “Properties” button. Make note of the current settings. Select "Use the following IP address". Enter an IP address such as 192.168.0.5. Close all windows for the configuration to take effect. Start your Browser and type 192.168.0.100 in the URL field. The index page should be displayed. Set the IP address of the unit to your network, then restore your settings. Right click on your LAN connection and choose “Properties”. Under the IP Address settings, click the “Add” button. Enter a new IP, such as 192.198.0.5, and a subnet mask of 255.255.255.0. Press the “Add” button. This new IP is added the list. The default user name is "admin" (lower case) and password is “1234”. After configuring the unit, you may delete the additional IP address. Q: Can you explain the auto-ping settings? To enable auto-ping, the check-box to the left of the IP address must be checked, then the change button pushed. You will get a message "Autoping will automatically be enabled after 10 successful pings". This prevents rebooting units before conditions are properly established. The time between which each ping is set. The time between pings to a particular device is (Time_Between_Pings * Number_of_devices_enabled_in_the_ping_list). Number of times the ping has to fail (in a row) on a given device before it is power cycled. Number of times to attempt power cycling before giving up and disabling auto-ping. Length of time after a power cycle before checking for a response from the device. This allows a device or computer time to completely boot up. Question: Can I set the session timeout longer? Log into the unit and choose the External APIs link. If the REST API is not enabled, check the REST API checkbox and press submit. Enter a time in seconds. The next time you login, the timeout will take effect. Q: How can I control the switch from my own applications? The best way is the new RestAPI, but you can also download a command line user utility. There is also a C++ HTTP example with source. Windows users can download a Perl interpreter to run the script version. This script (ver 4.0) is compatible with all current and legacy DLI power controllers via HTTP. Q: Can you develop custom firmware for my application? we can send you an estimate of the time involved to code, debug and test. A kick-off meeting in Silicon Valley usually works best. Q: Can you develop custom hardware for my application? Glad to. We've done this for many customers. Call or email engineering@digital-loggers.com to get started. Q: Do you support PowerMan? Yes, absolutely. The code is added to the tarball. Download the Powerman User Utility here. (c) Digital Loggers, Inc. 2018.